James was born in 1892, the third son and fourth child of George Smith and his wife Mary Ann. George senior was a blacksmith, born in Donnington, and did not travel far from his roots. His first children, Margaret Mary (1887) and Cecil Stuart (1888), were born in Bagnor, a short walk from the heart of Donnington village. The next three children, Isaac William (1891), James Henry (1892) and George Herbert (1893) arrived while the family was living in Speen; in truth Bagnor is a hamlet of Speen, and ‘Speen’ usually refers to the main village - Church Speen. One more child born in Shaw, Ernest Albert (1896) and finally, three more, Edith Annie (1899), Maude (1906) and Arthur (1909), in Newbury show the family’s moves over the years. In Newbury they settled in Falcon Court, a small alley of three cottages opening off Northcroft Lane, between the Temperance Hall and the former Child’s Almshouses. Their house, No 2, was a small four-roomed cottage that must have been very cramped if the whole family were there at once. However, the older children were flying the nest by the time their youngest siblings arrived. Isaac, the third child, opted for a job in khaki, signing up with the Royal Berkshire Regiment in January 1909 and served with the 2nd Battalion in India. Around the end of 1910 another brother, George Herbert, followed Isaac’s example and joining him in India in 1912 after training in England with the 1st Battalion Royal Berks, stationed at Dover Castle. At the time of the 1911 census James was working as a jobbing gardener, a precarious existence reliant upon the vagaries of the weather. When war broke out in August 1914 he was one of the many who came forward to serve their country. So many volunteered that they became known as Kitchener’s Army after Field Marshall Lord Kitchener, Secretary of State for War, whose face adorned the famous recruitment posters with the slogan Your Country Needs You. The infantry regiments created new battalions to take the volunteers; four such battalions from the Royal Berkshire Regiment (the 5th to 8th Battalions) were to see action during the Great War. James found himself in B Company of the 6th Battalion training in Essex near Colchester. The 6th Battalion was made up of men from Birmingham and Wales as well as Berkshire. In May 1915 they moved to Salisbury Plain where, in July, they were inspected by the King and told they were about to go to France. The lucky ones got four days’ embarkation leave and a chance to visit their homes – for many families this would be the last time they saw each other. On 27 July 1915 James landed in France, and in early August the battalion was moved to Bouzincourt, north-west of Albert. Here they had their first taste of trench warfare in training with the 154th Brigade and their first casualty (Private Danby of C Company was wounded by a shell). However, it was not until 22 August that they had their first spell in the front line, manning trenches opposite Mametz, a few miles north of Bray-sur-Somme. Five days later, on 27 August the battalion war diary reported: The day was quiet and work was proceeded with. The trenches want a lot of attention - accommodation for our numbers of men & officers being totally inadequate. The difficulty in getting wood is retarding the progress of our improvements. Timber & all materials for dug-outs - defensive positions etc - bombs and grenades are badly wanted & not easily obtainable. The Essex Regt (one Coy) took over the Citadel, & are employed in RE fatigues and digging a communication trench. The enemy shell the cook-houses etc at the citadel frequently - but with no result. Our Artillery was busy on the enemy's trenches during the day. At 8pm a rifle-grenade exploded on our left sector. Ptes Greenhaugh & Green of B Coy being wounded. At 8.30pm a sausage exploded close to Coy HQ of our left sector. Some damage was done & the following NCOs killed & wounded - KILLED Sgt Skurry, L/Cpl Bettis; Ptes Westall, Smith & Gillam. WOUNDED - Ptes Slater, Gorton and Neil. All these men belonged to "B" Coy. Some aerial torpedoes - two more sausages and a number of rifle grenades were fired at us during the rest of the night, but no further casualties occurred. The night passed without further incident. The enemy were busy repairing damage done to their lines by our Artillery between points 311 & 313. Pte Gee - "A" Coy was buried in the afternoon. The B'dr visited the trenches during the evening. 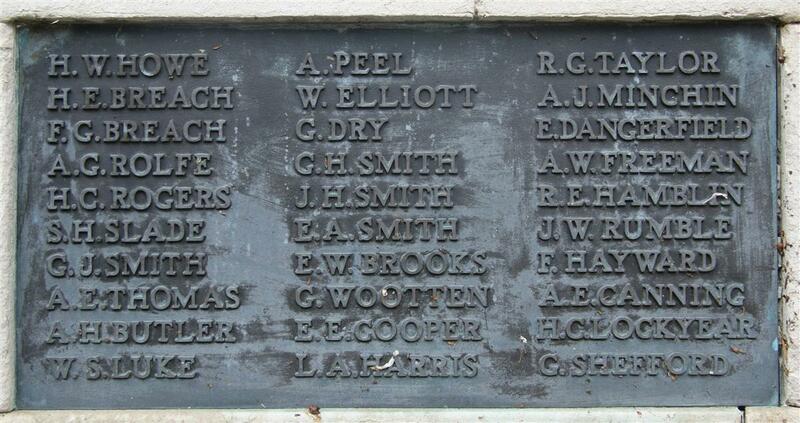 There were many Pte Smiths, but this was James’ death that was being reported. It is unusual to find the names of other ranks in a war diary entry, but death was still not a familiar companion in the 6th Battalion after less than a week of front-line duty. The ‘sausage’ mentioned in the diary was slang for a German trench mortar round. Much sympathy is felt for Mr and Mrs G Smith of Falcon-court, Newbury, who have just lost a second son as a victim of the war. He was Private James Smith, of the 6th Royal Berks, and was serving in France with the Expeditionary Force. He had been on service since the outbreak of the war. A brother was killed at Neuve Chappelle in March and another is lying in Ipswich Hospital with a broken leg. James’ body lies in Citadel New Military Cemetery, Fricourt, France in grave II C 8. The close proximity of two more stones (Privates J Smith & F Westall) is typical of a shared grave, they lie as they died - together. The Battalion war diary entry for 29 August refers to their burial: Sgt Skurry Ptes Westall & Smith were so blown to pieces that they will have to be buried in one grave. Three rifles brought back from scene of explosion smashed andtwisted. Sergeant Thomas Clement Skurray was also from Newbury (Stanley Road); his death was reported in the same newspaper as James’. The family record of Mr and Mrs G Smith of Falcon-court, is extremely creditable. They have had five sons serving in the Army, three of whom have paid the great sacrifice. Isaac William has served seven years, and has been twice wounded. George, who has been five years in the Army, was killed in the battle of Neuve Chapelle. James Henry was killed in action after having been in the army 10 months, as also Ernest Albert on October 13th, 1917, having served one year and nine months. Cecil Stuart is at present serving with the forces. Two daughters were employed on munition work, one having died, and the other being on the sick list. Locally James is remembered on Panel 10 of the Newbury Town War Memorial and both the parish memorial board and roll of honour in St Nicolas’ Church, Newbury. He was also remembered on a memorial board in Speenhamland School, now lost. The same memorials also remember the names of his brothers, George Herbert and Ernest Albert, who also lost their lives on the Western Front, as reported in the newspaper item above. Isaac survived the war but was wounded twice, the second occasion resulting in his discharge from the Army on 27 July 1916. Another brother, Cecil Stuart also donned the khaki uniform and survived; the sixth and final brother, Arthur, was too young to serve. The sister reported in the paper as having died was probably the eldest, Margaret Mary; the death of a Margaret Smith was registered in Newbury in the April-June Quarter of 1917. The second sister employed on munition work was, Edith Annie, the third and final sister, Maude, was only eleven at the time.